Betting sites for NFL have the Kansas City Chiefs as three-point road dogs versus the Los Angeles Chargers. However, the Chiefs have seen worse odds and conquered them before. At least as far as the first game of the regular season is concerned. The first game of the previous regular season, to be precise. Kansas kicked off the 2017 season as eight-point underdogs against the Patriots in New England. The Chiefs not only got the straight-up win, but also covered the spread, thanks to a 42-27 upset. That was the start of a very promising season that fell apart midway through. But that is a tale for another time. As for the Bolts, things seem to finally be starting to turn around since they moved to Los Angeles. In 2016, their last year in San Diego, the Chargers started the season as 6.5-point underdogs versus the Chiefs. This season, as mentioned above, they are three-point faves against the same team. Speaking of which, in ’73, Kiss was opening for Blue Oyster Cult. One year later to the day, man… Blue Oyster Cult was opening for Kiss. But that is yet another tale for yet another time. This will be the start of the Patrick Mahomes era, which may have something to do with the Chiefs’ betting sites for NFL odds. However, for wide receiver Tyreek ‘One Tree’ Hill, his paring with the second-year QB was “meant to be.” Like John Cusack and Kate Beckinsale in Serendipity. “For me, it’s still going to be the same,” Hill said. “I’m still going to be the guy that’s going to make the big plays. Sammy [Watkins] is going to be the guy that makes big plays also. I mean, we’ve got what it takes to go all the way. The addition of Sammy helps us. Not only me, Kelce, Kareem, we’ve got more weapons on the field now.” He added that he had never worked with a quarterback with Mahomes’ arm strength. Ooh, sick burn on Alex Smith. On defense, defensive end Chris Jones says he wants “to lead the NFL in sacks.” A word of warning to Philip Rivers, then. Starting QB Rivers is just one player in a roster that has remain tightly knit from last season. “Continuity is really important to have in this league. It’s hard to get,” General manager Tom Telesco said. “I think we’re the only team in the division probably with the head coach and the coordinators coming back, right? Denver made one change. Obviously Oakland was a big change, and Kansas City made one change. “So it’s, yeah, I love that part of it.” The Bolts may not have lost anyone important to free agency or in a trade. However, there is one thing they can’t control. And that’s injuries. Such as a torn Achilles. And not one torn between fighting the Trojans or staying in his tent, either. We’re talking about cornerback Jason Verrett’s Achilles heel. Which turned out to be his literal Achilles heel. As a result Verrett will miss the 2018 season. The Chiefs are 4-1 SU in their last five games. The Chiefs are 4-1 ATS in their last five games. The total has gone under in four of the Chiefs’ last five games. The Chargers are 6-1 SU in their last seven games. The Chargers are 6-2 ATS in their last eight games. The total has gone under in the Chargers’ last six games. 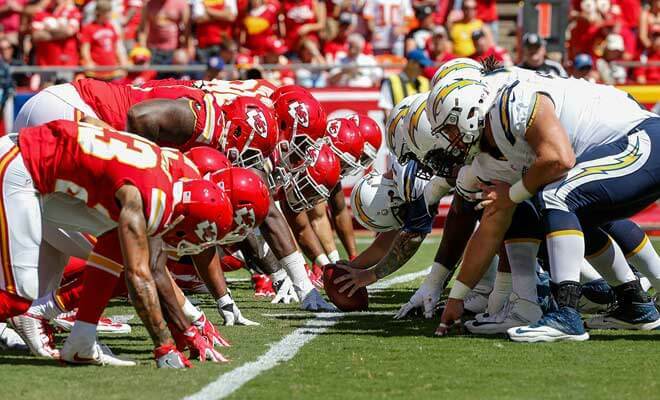 Our Free Prediction: Chiefs will beat the Chargers 24-10.